Note: If you already have an ntouch VP you do not need to apply for an ntouch VP2 upgrade. We will contact you when the ntouch VP2 is being installed in your area. Note: ntouch PC and ntouch for Mac accounts work on both PC and Mac computers. If you use ntouch PC and ntouch for Mac at the same time, you will need to have two separate accounts. Note: ntouch for Mac and ntouch PC accounts work on both PC and Mac computers. If you use ntouch for Mac and ntouch PC at the same time, you will need to have two separate accounts. Note: ntouch Tablet and ntouch Mobile accounts work on both tablet and mobile devices. Note: ntouch Mobile and ntouch Tablet accounts work on both mobile and tablet devices. Please enter the information of the deaf person who will be using this product. First Name *First name is required. Middle NameMiddle Name is required. Last Name *Last name is required. Street Address *Street Address is required. No PO boxes. Zip *Zip Code is required Email *Valid email address is required. Information required by the Federal Communications Commission (FCC). * If you do not have a Social Security number, please contact Customer Service. Birthday *Please specify your birthday.Please specify a valid birthdate. for minors under the age of 18 years old. Guardian's First Name*Guardian First Name is required. Guardian's Last Name*Guardian Last Name is required. Guardian's Email *Guardian Email is required. Guardian's Phone Number *Guardian Phone is required. Do you have a Sorenson Videophone? *Please indicate if you have a Sorenson Videophone. Have you changed addresses in the last year? Can we contact you with information about Sorenson products and SVRS? *Please indicate if we may contact you. 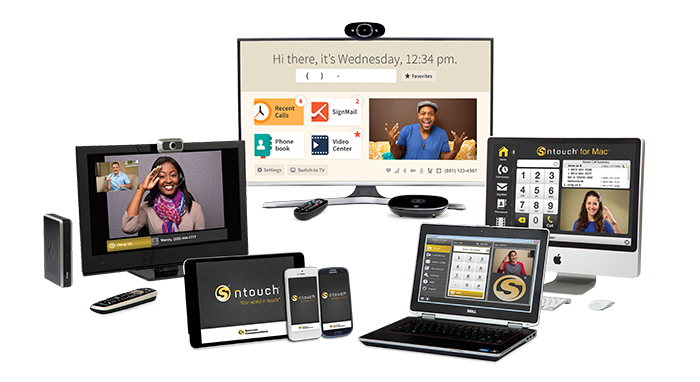 Sorenson Communications provides free ntouch accounts exclusively for deaf individuals who require VRS to place and receive calls. Are you deaf? *Please indicate if you are deaf or hard of hearing. Is ASL your primary language? *Please indicate if ASL is your primary language. What kind of internet connection do you have? *Please indicate your internet connection. Who is your internet service provider (ISP)? *Please indicate your internet provider. Other internet provider *Please specify your internet provider. Tell us about your computer: *Please indicate if you have a computer and webcam. Referred by? (name)Contact Name is required. How did you first learn about Sorenson VRS? VRS providers are required to collect customer data for the FCC User Registration Database. Failing to provide the required data, or supplying inaccurate data, will result in being denied video relay service. By clicking “Accept,” you: • Agree to receive and sign certain agreements, together with the accompanying disclosures, electronically. This consent applies to this agreement, the self-certification that follows this agreement, and the End User License Agreement. You agree to these agreements and any future, updated versions of them. Without your consent, you cannot use our service. Withdrawal of consent later will result in termination of our service. Your acceptance of this consent and of those agreements and disclosures will constitute your legally binding electronic signature. If requested by you, we will email copies of each of the agreements and disclosures to the address you provide. The documents will be sent in Adobe pdf format. In the future, you can obtain additional copies by calling CIR with your videophone at 1-801-386-8500. • Agree to select Sorenson as your default provider for Video Relay Service, as described below, which means that outgoing and incoming calls will be placed through Sorenson by default, unless you or the other party “dials around” to another provider. If you are not porting in a telephone number, you request Sorenson to provide you a ten-digit telephone number. • Request that Sorenson open a Video Relay Service account in your name and that Sorenson provide you a ten-digit telephone number for that account. • UNDERSTAND THAT IN ORDER TO PROPERLY ROUTE 911 CALLS TO LOCAL EMERGENCY SERVICE PROVIDERS, YOU MUST PROVIDE SORENSON THE ADDRESS WHERE YOU WILL USE YOUR SORENSON VIDEOPHONE. You can update your 911 address using your ntouch software or by contacting customer support. • Affirmatively acknowledge that you have received, read, and understood the document found at http://www.sorenson.com/disclaimer, which among other things (1) limits your ability to sue Sorenson, its agents, and its contractors for claims arising out of your use of VRS; (2) describes important limitations regarding the ability to use VRS to dial 911; and (3) contains important information about ten-digit numbering. • Affirmatively acknowledge that you have received, read, and understood the advisory on process for obtaining toll-free numbers found at http://www.sorensonvrs.com/tollfree. • Affirmatively agree, as described below, that Sorenson can and may disclose certain personal information (described below) to the TRS User Registration Database, which will be made available for review by the Federal Communications Commission, the TRS Fund Administrator (currently Rolka, Loube, Saltzer Associates), their respective agents and any person or entity designated by either of them for access to the database. You further acknowledge that failing to provide consent will result in being denied video relay service. • Affirmatively acknowledge that before Sorenson can provide you Video Relay Service, the FCC requires the collection of certain information and that it is imperative for you to provide complete and accurate answers to the information requested. -------------------------------------- A. SELECTION OF SORENSON AS YOUR DEFAULT PROVIDER AND PORTING YOUR TELEPHONE NUMBER Selecting Sorenson as your “default provider” for that ten-digit telephone number means that outgoing and incoming calls will be placed through Sorenson by default, unless you or the other party “dials around” to another provider. If you wish to port an existing VRS telephone number from another default provider to Sorenson, you may do so by following the instructions listed here: http://www.sorensonvrs.com/apply/porting. If you choose to port your number from another provider, Sorenson will issue you a temporary ten-digit number (as described above) until the process of porting your existing number is completed, after which Sorenson will become the default provider for the ported number. You may: (1) Obtain a telephone number from, and register with, your default provider of choice—notwithstanding any prior relationship you may have had with another provider; (2) Change default providers at any time and, in doing so, retain your telephone number by porting the number to the new default provider; (3) Make calls through, and receive calls from, any provider (and you are not limited to making or receiving calls through your default provider). In addition, (4) Sorenson cannot condition the ongoing use or possession of equipment, or the receipt of different or upgraded equipment, on your continuing to use Sorenson as your default provider. -------------------------------------- B. CONSENT TO DISCLOSURE OF PERSONAL INFORMATION To ensure proper administration of the TRS program, the FCC requires all VRS providers to collect and submit specific data to the TRS User Registration Database (TRS-URD). The following account information will be submitted to the database and made available for review by the Federal Communications Commission, the TRS Fund Administrator (currently Rolka, Loube, Saltzer Associates), their respective agents and any person or entity designated by either of them for access to the database: Full Name Residential Address Videophone Number 911 Address Birthday Last four digits of your Social Security Number Selected VRS provider name and dates of service initiation and termination A digital copy of your self-certification of eligibility for VRS and the date obtained by the provider The date on which your identification was verified by the provider The date on which you last placed a point-to-point or relay call By clicking on the 'Accept' button, you consent to allow Sorenson to share your registration information as described above with the TRS-URD. *Accept You must accept the Consents and Disclosures to apply.